From writer-director Shane Black comes the latest installment in the franchise, featuring alien menaces that hunt humans with R-rated relish. Rating: 2 stars out of 4. In the beginning (it was 1987), there was “Predator” vs. Schwarzenegger. Audiences swarmed to see it, prompting the studio to decree: “Let there be a franchise.” And so it came to pass. In 2004, there was “AVP: Alien vs. Predator.” Cage match of the extraterrestrials! (Actually, it took place in a pyramid). Another audience swarm. A franchise reborn. 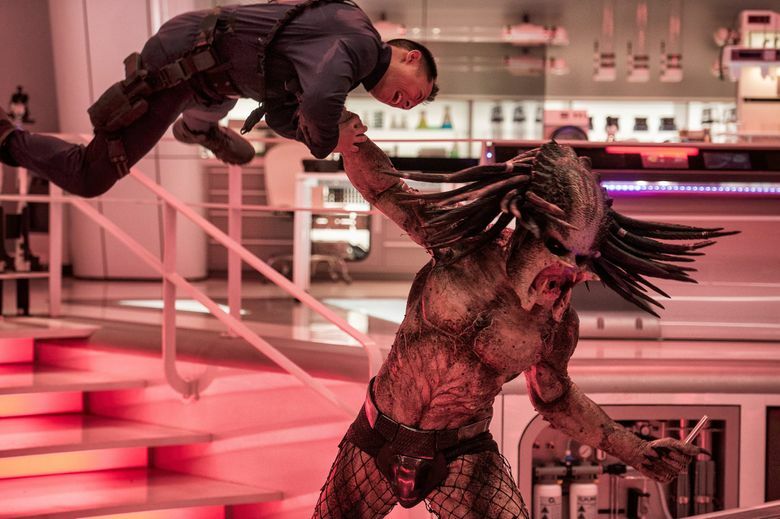 Now comes “The Predator,” featuring the Predator vs. an even bigger Predator. Two, count ’em, two monsters — with big, bad fangs and swirling dreadlocks, doing their damnedest to tear each other to shreds. From writer-director Shane Black comes this latest “Predator.” He’s the man behind “Lethal Weapon,” “The Last Boy Scout,” “Last Action Hero” (writer); and “Kiss Kiss Bang Bang,” “Iron Man 3,” “The Nice Guys” (writer-director). His writing is distinctive. By his F-bombs shall you know him. Men, women: All let fly with identical fervor. Equality! From outer space they come, these Predators. To hunt humans. With weapons of the highest tech. With a cloaking gizmo to render them invisible. To rip, rend, tear and eviscerate. To splatter the screen with red stuff. Black does like his gore. Similar to the scenario of the original picture, it’s a band of grizzled soldier types who battle the alien menaces. Missing, however, is a formidable leading-man presence in the Schwarzenegger mold. The top guy in this outfit, as played by Boyd Holbrook, is so lacking in charisma that he often seems to vanish from view even when he’s central to a scene. Those alien cloaking devices having nothing on this guy. The director makes the former-soldier comrades in arms a scroungy bunch of PTSD-plagued twitchy types, literally in the case of a character played by Thomas Jane with Tourette syndrome. These guys — played, in addition to Jane, by Keegan-Michael Key, Augusto Aguilera, Alfie Allen and Trevante Rhodes — supply the movie’s humor in the form of smart-aleck remarks liberally laced with sexism and other non-PC gibes. They’re also on hand to be casualties. A foulmouthed lady scientist — Equality! — played by Olivia Munn and the young son of Holbrook’s character (Jacob Tremblay), a kid with autism who is a kind of savant genius, round out the cast. Oh, and did I mention ravening Predator dogs from outer space? This picture has them, too. 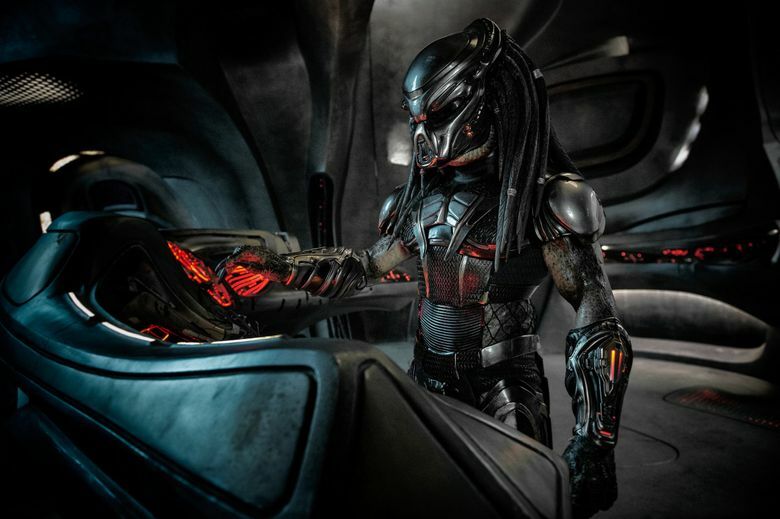 ★★ “The Predator,” with Boyd Holbrook, Trevante Rhodes, Jacob Tremblay, Olivia Munn, Keegan-Michael Key, Thomas Jane, Augusto Aguilera, Alfie Allen, Trevante Rhodes. Directed by Shane Black, from a screenplay by Black and Fred Dekker. 107 minutes. Rated R for strong bloody violence, language throughout, and crude sexual references. Opens Sept. 14 at multiple theaters.